Before you pack a bag for your pet, it is important to verify that the animal will be welcome wherever you are traveling for the holiday. While your dog, cat, or other animal may be a treasured member of your family, more distant relatives and friends may not feel the same way. There may not be enough space for your pet to be one more guest, or there may be allergy concerns to be aware of. If you’re planning to stay at a hotel or resort, be sure the property will welcome pets. Also verify that you have the proper transportation for your pet, such as verifying that airline or bus policies will welcome your pet as a passenger. While you are checking on the holiday accommodations and transportation for your pet, also consider whether the travel is best for the animal. Older pets or those with extra sensitivity or special needs may be unduly stressed by holiday travel, and could be more comfortable if they stay at home in a more familiar environment and routine, even if that means they aren’t with you for the festivities. When you are ready to take your pet along on a holiday trip, it is important to pack as carefully for your pet as you would pack for yourself. These must-haves are essentials that should be part of your pet’s luggage for any holiday trip. Paperwork – Bring along your pet’s current vaccination records and a recent health certificate from your veterinarian. Ownership records can also be useful should you accidentally get separated from your pet during the trip. Identification – Your pet should have current ID tags on its collar, as well as your contact information on its carrier or crate. If your pet hasn’t been microchipped, it can be helpful to have that done before a holiday trip, and take a photo of your pet just before you travel. Safe Restraints – A properly sized, appropriate strength leash, collar, harness, and seat belt are all necessary for your pet, depending on the type of animal and how you will be traveling. Be sure each item fits well and has reflective strips if you may take your pet out at night. Carrier – A safe, secure carrier or crate will give your pet a space of its own while you travel, and can be used in a hotel or another home as its bed and safe space. Be sure the carrier can be cleaned if necessary, and has proper ventilation for your pet’s comfort. Medication – If your pet requires regular medication, bring along enough of a supply to see it through the entire trip, plus a bit extra for any unexpected delays as you travel. Bring the prescription details as well, just in case a refill might be needed. Food – Pets are used to a specific diet, and you want to be sure and pack enough food and treats for your pet’s meals during your entire trip. This will minimize the risk of any digestive problems or stomach illnesses that can put a damper on holiday festivities. Dishes – If you pack along your pet’s familiar food and water bowls, they will eat and drink more easily during the trip. Collapsible dishes are convenient for travel, but be sure your pet is used to them before you set off so the dishes remind your pet of home. Bedding – Familiar bedding will help your pet settle quickly into a new space, whether it is at a different home or in a hotel. A blanket or old shirt is an ideal choice to make your pet feel welcome and right at home even in new locations. Toys – You’re sure to be busy with holiday events during your trip, and bringing along favorite toys will help keep your pet busy and out of trouble as well. Bring 2-3 different toys, including good quality chew toys to distract your pet from other temptations. Toilet Essentials – Your pet will need to relieve itself as you travel, and bringing along plenty of poo bags or a portable litter box or potty pads can make it easier to clean up and keep your pet comfortable and at ease. Weather Gear – If you will be traveling to a different climate, it may be useful to bring along appropriate gear to keep your pet safe and comfortable. Pet-friendly booties or winter coats are great for winter travel, or if you’re heading for the beach, consider a pet lifejacket. Grooming Supplies – Getting your pet groomed before you travel is a good idea, but still pack their combs or brushes for touch ups during the trip. This will also help minimize loose hair and shedding, and will comfort your pet in unusual situations. 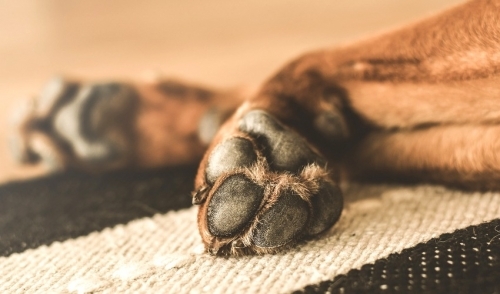 Towels – A large towel or sheet can be useful for cleaning up after your pet in an emergency, or can be used to cover furniture, car seats, or hotel bedding to keep fur, muddy paws, or slobbery kisses from getting everywhere. First Aid Kit – To really be prepared for emergencies, pack along a first-aid kid with everything you might need to tend to minor wounds or problems with your pet. Also research local veterinarians at your destination in case you may need to make an emergency visit. Luggage – It can be helpful to have a small piece of luggage dedicated to your pet so all its supplies can be kept in one convenient location. This luggage should also have your contact information and where you will be staying, in case it is accidentally lost. 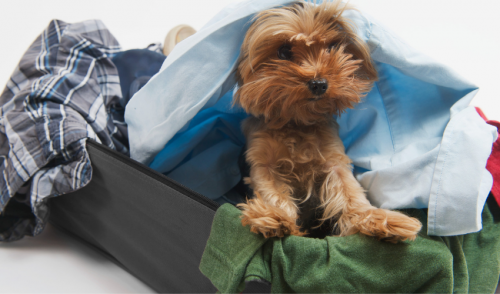 Packing for your pet doesn’t have to be a struggle, and if you have these must-haves on your packing list, both you and your pet will be ready for a fantastic holiday getaway.